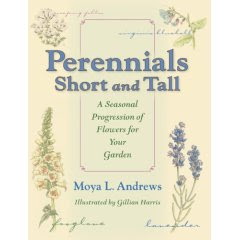 These past few rainy days, I’ve been reading “Perennials Short and Tall: A Seasonal Progression of Flowers for Your Garden” written by Moya L. Andrews and illustrated by Gillian Harris (Quarry Books). I knew right away when I read the preface that I was reading a book written by a true gardener. The first four chapters of the book cover gardening basics ranging from plant nomenclature to preparing planting beds, caring for perennials, and even how to display flowers in your home. I enjoyed reading these chapters, even as an experienced gardener, because they aren’t strictly “how to”, even though that’s the focus. It’s more like listening to an experience gardener provide her own insights and tips gleaned from years of actually gardening. The last three chapters include information on 25 perennials that bloom in spring, summer, or fall, with a focus on those that do well in Zones 4 – 7. The perennials included are good, reliable performers, that any gardener in a temperate climate should have success with, given basically good growing conditions. The book ends with 22 appendices for further reference and includes list such as “Plants that Prefer Constant Moisture”, “Drought and Heat-Tolerant Plants, Short Perennials for Summer Bloom, etc. This book would make an excellent gift for the beginning gardener, who has discovered the joy of having a garden full of perennials, and wants to learn more about how to have flowers blooming in succession through spring, summer, and fall. But as an experienced gardener I enjoyed it because it is well-written, with garden sayings and verses sprinkled throughout, and beautiful color illustrations of each flower. I would love to find a book like that only for zone 8-9. I am trying to plant more perennial in my garden and less annuals. I think I will still look this book up at my local library. I could still gleen some great tips from it otherwise. I think she might be speaking at this year's INPAWS fall conference, but I'm not sure. They had her book at the plant sale, and now I'm regretting not picking it up then. Thanks for the great review. Souonds like a good book Carol. Most books about perennials for the midwest are written for the Upper midwest rather than the lower mid west. Just a note to say thank you for your blog; I really enjoy it! You're another big part of my inspiration to start gardening again--containers, outside, since I share my apartment with four cats. May your gardens continue to bring your delight and amazement! Thank you again for sharing them! Great recommendation, Carol. Thx! I have a friend who is just beginning to garden. Think it will make a good gift for her. Carol, I agree that this book sounds interesting. Especially since it is illistarted. It helps me a lot to see what plants look like and how they look in the garden. I have posted for bloom day. Thanks for all your hard work! Thanks, Carol! It's well suited for me - pretty much a beginner. I'm saving this post so I'll remember to order it. You always give such good advice but I think I'd like to own a reference book and it sounds artsy, too. I love photos. I hope you are drying out OK. Sounds like a great reference book--I'll have to check it out. I was reading yesterday's post--funny, it never occurred to me all day that it was Friday the 13th! My green beans did not turn out well at all, and I was planning a try at a second planting this week. Now I know the reason--I planted them north and south! I'll let you know if the east-west idea does the trick this time.